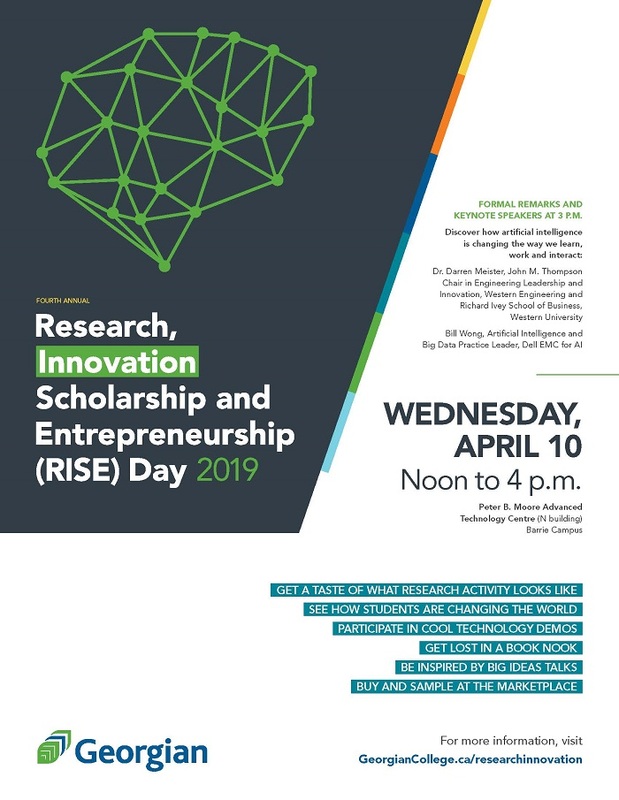 Georgian is hosting the fourth annual Research, Innovation, Scholarship and Entrepreneurship (RISE) Day from noon to 4 p.m. on Wednesday, April 10 in the Peter B. Moore Advanced Technology Centre at the Barrie Campus. This is a chance to celebrate, share and showcase the amazing research-related and changemaking projects happening across the college. See how Georgian students are changing our community — and the world! Darren is the John M. Thompson Chair in Engineering Leadership and Innovation at Western University and is a member of Western Engineering and the Ivey Business School. His interests focus on design thinking, technology-based entrepreneurship and the role of technology in enhancing organizational effectiveness, specifically as it concerns innovation processes. His research work is conducted within companies in close co-operation with practitioners. A native of Collingwood, he was a Rotary International Foundation Scholar, attending the University of Cambridge. Subsequently, he earned his PhD at the University of Waterloo. Bill is from Dell Technologies and currently leads their AI and Data Analytics Practice for Canada. This means he’s had the opportunity to assist numerous companies and higher educational institutions develop business and technology for their AI and advanced analytics investments. He also manages key Canadian AI partners, which includes Intel, Nvidia, and numerous AI start-up companies. Previously, Bill held data-focused and director-level positions in sales, pre-sales, marketing and development during his tenure at Oracle, Microsoft, and IBM. Outside of speaking on AI and data-related topics at conferences around the world, Bill has also published a number of books in the areas of database technologies, advanced analytics, and bio-informatics.